Video editing software is the one which allows a user to do post-production work that is the compilation of music, the addition of music track, and application of graphics and so on. Video editing app allows you the liberty of doing non-linear editing which was not possible earlier when movies were shot on celluloid. 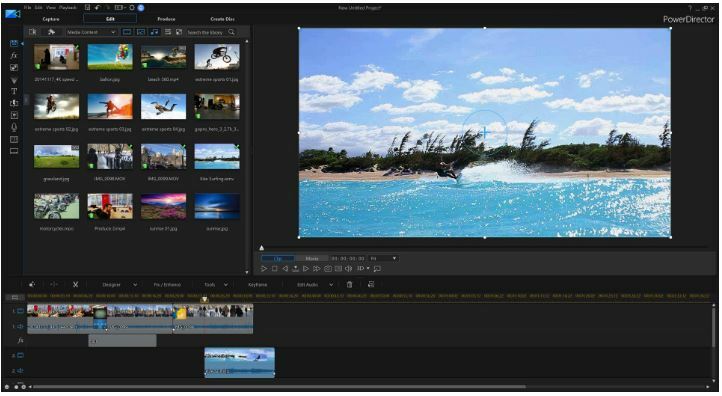 The non-linear editing feature offers a wide array of functions like trimming, cutting, arranging clips on a timeline also color manipulation and special effects can be applied. The user interface of the program is quite simple and sorted as for video editing app giving you a wide array of options. Although when you are deep into the editing it can become complex especially when it comes to fine-tuning video or applying audio effects. You start off with a Welcome screen which offers you big buttons option of timeline mode, storyboard mode or a slideshow creator mode. If you don’t need or want these choices then there is a simple Always Enter Timeline Mode checkbox, which you can click and you are good to go. It also gives you an option to choose your video project aspect ratio – 16:9, 4:3, 9:16. The PowerDirector has the editing interface which has a traditional source and a preview split panel. It will track your timeline along with the whole width of the bottom of the screen. In storyboard view you can drag transitions between clips, you can even apply effects and add audio clips according to your reference without switching between timeline modes. It also has buttons at the top for showing just videos or just photos or audio in the source panel. PowerDirector timeline is easy to access, customize and navigate. There are four mode choices at the top, that is capture, edit, produce or create a disc. Cyberlink even gives you default video and audio tracks. There are three pairs or video and audio track. It even has effects, titles, and voice and music tracks. You can even lock or disable enable view or rename tracks. It has a dope feature of zooming the timeline in and out by ctrl-mouse wheel or slider control. 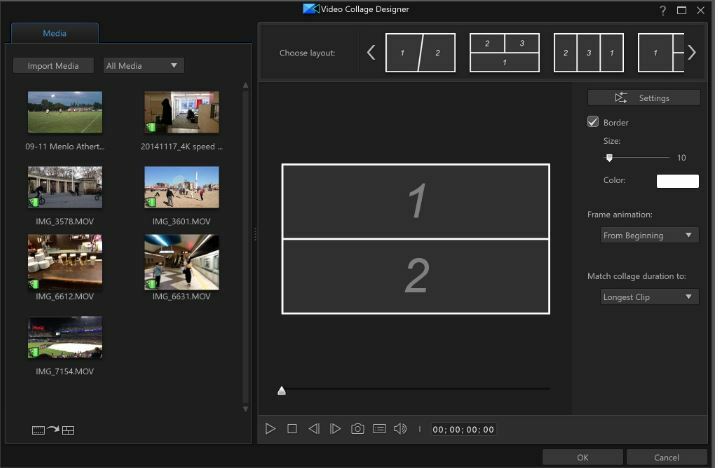 PowerDirector, like any other editing software, gives you the feature to join and trim clips on the timeline. 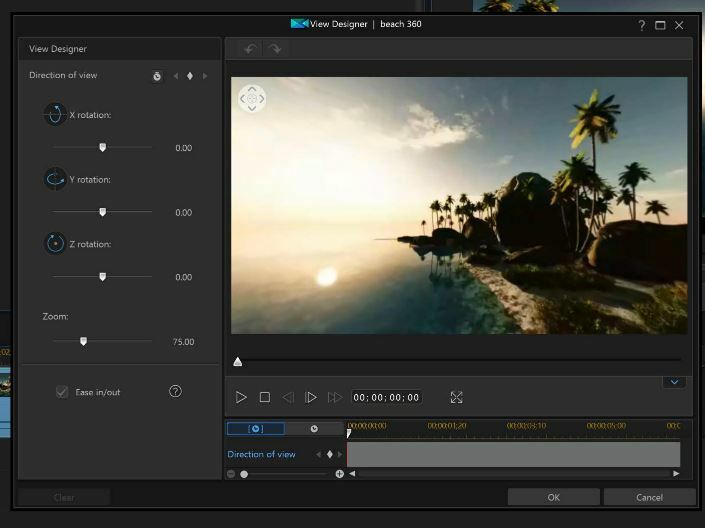 But it has some change that instead of just joining or trimming clip before snapping a clip next to an existing clip on the timeline it will give you an option and will give you a tooltip with five options such as overwrite, insert and insert and move all clips, crossfade and replace. You can get the clips lined up without fuss too by using the insert button that appears below the source panel. It provides you with a trim tool which gives you precise control. It comes with two sliders and the multi-trim tool that let you mark in and out points on the clip, it is a useful tool for cutting the chaff. PowerDirector’s selection cursor is used to split video and delete sections. It can fix and enhance by options which also include video denoise, audio denoise, and enhancements to punch up color and sharpness. It can also fix lighting and color and you can independently adjust the brightness, contrast, hue, saturation, sharpness, and white balance. CLUTs: color lookup tables, it gives your movie a uniform look by applying a color mood just like in a professional feature film. PowerDirector supports a large number of file formats that includes 3DL, CSP, CUBE, M3D, MGA, RV3DLUT, and VF. One of the best things to come to home video editors lately was spearheaded by Apple with the Trailers highlight of the Mac’s incorporated iMovie application. Adobe as of late included a comparative apparatus, Premiere Elements’ Video Story highlight. With both of these, you fill formats in with video and photograph content that addresses the issues of a spot in the creation, for example, Group shot, quit for the day, Action shot. These are expounded with changes and ambient melodies that match your picked topic. PowerDirector has a comparable device, Express Project, which you can enter specifically from the program start-up board. There are nine Express Projects accessible for download, including Action, Extreme, Round the World, Wedding, Adventure, Anniversary, and Love. An Express Project just requires two stages: Dragging an Opening, Middle, and Ending onto the course of events, and filling the subsequent clasp tracks with your media. PowerDirector 16 is the Video Collage Designer. This is like an instrument that showed up in the last form of Adobe Premiere Elements. Gotten to from the Plug-ins catch, the Video Collage Designer demonstrates layouts with your clasps as an afterthought. You basically simplified the last into the previous, and you get a clever energized picture in picture. PowerDirector as of now had one of the most grounded picture-in-picture instruments around, yet this is a less demanding approach to get a satisfying outcome. To add a 360-degree clip to your project, PowerDirector opens up a dialog box asking if you want your output to be 360 or 2D. If you choose 2D, the View Designer window opens, which let you choose the movie’s point of view and then you can move the angle around in this window’s preview in three axes (x, y, and z). Tapping on up, down, left, and right, bolts adjust your perspective and tapping the focal point of the bolt control snaps the view to straight on. You can zoom the view, and conveniently, utilize keyframes to consequently change starting with one perspective then onto the next. That last alternative can exploit the Ease In choice, which makes the movement all the more normally quicken and decelerate, instead of happening mechanically. For ventures that you expect to yield in 360-degree design, you can even now utilize the essential trimming, part, and joining altering apparatuses, however, there are a pack of PowerDirector highlights you can’t utilize: Magic Movie, video trimming, and substance mindful altering. You additionally can’t effectively blend non-360 substance into a 360 task. Including titles and changes is as yet conceivable; the program currently offers 11 360-degree title choices, incorporating some with fly-in activities. You can likewise switch up the textual styles with more than 100 decisions and apply impacts like stroke and drop shadow. These 360 titles remain set up as the watcher moves around, as opposed to simply statically staying over the picture. Be that as it may, you can likewise move them around, change straightforwardness, and scale, all utilizing key frames—entirely cool. Once you’ve altered the substance to taste, you yield to H.264 MP4 arrangement, or you can transfer specifically to Facebook, YouTube. The exporter gives you a chance to pick a security level and goals, including 4K as a choice. The 360 editorial manager doesn’t give you a chance to fare to H.265, which would be pleasant considering the document size of 360-degree 4K substance and H.265’s prevalent pressure. PowerDirector can fare to H.265 for standard, non-360 substance, in any case. It has the fast rendering of your project. It will be quick in rendering the project file in whichever format your desire. PowerDirector gives you loads of effects to apply and experiment with. It gives the most 360-degree video capabilities. It gives you the feature of multi-camera editing. It has motion tracking and screen recording too. Unlike other editors like Adobe Premiere Pro and FCP, it does not have the feature of trimming in source panel. The abundance of options can make the interface overwhelming. The 360-degree video cannot be outputted in H.265 format. 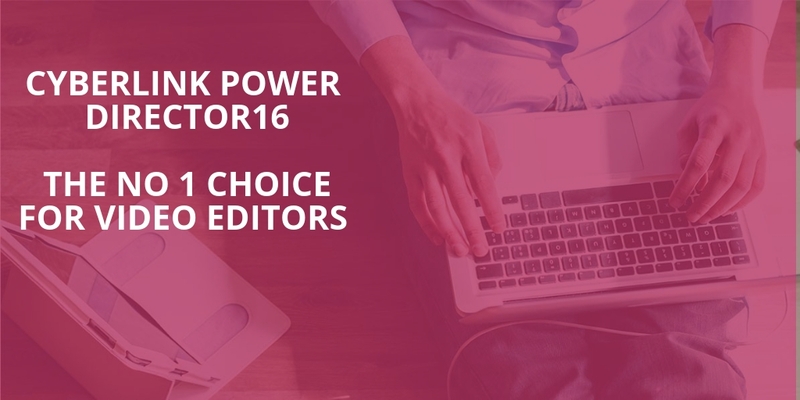 PowerDirector is a great choice for a beginner, casual or a seasoned editor too. It is easy and enjoyable and gives you a variety of things to try from. One of the best video editing tool available in the market.